Raised by mountain-loving parents on the flanks of the North Cascades, Jenny’s idea of a perfect day starts and ends wearing a headlamp, and includes a snowy approach, dry granite, and endless high fives with a favorite partner. Her passion for adventurous climbing has led her from the jungles of Rio to windy spires in Patagonia, from the unexplored faces of the Purcell Mountains to heady granite domes of North Carolina. 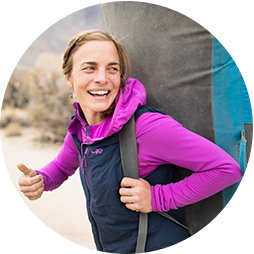 Currently based out of Asheville, NC, Jenny is a climbing guide and a writer, exploring the topics of climbing, life, and the spaces between.